One reason for this advice is that the biggest composition challenge is to simplify the contents of the captured picture space. Moving closer helps with this by forcing you to eliminate extraneous material at the image’s perimeters. When making an image, ask yourself – What attracted my eye to this scene? When you answer that question, strive to fill as much of the frame as possible with your answer and eliminate everything else. Your eye and mind work together to filter the unwanted material from your vision – but your camera sees and captures it all. This is why so many beginning photographers are disappointed with their images, saying things like – “I didn’t notice that ‘whatever’.” They just saw “what they wanted to see” – it’s the way our vision system works so be aware of it. Moving closer (and possibly using selective focus to create a shallow depth of field) is a key step in simplifying your composition. Fill the picture space with the key elements of what attracted your eye – and eliminate the surrounding “stuff”. The results of these two techniques are not the same. Try it. And the falls for sure. Lastly, the trees with their autumn color that brought me to the area (Weston, Vermont) in the first place. All those elements are present in this first (furthest) image — but is so much additional landscape needed? The three elements comprising my vision are captured by the upper right portion of this image and the rest is probably not needed. 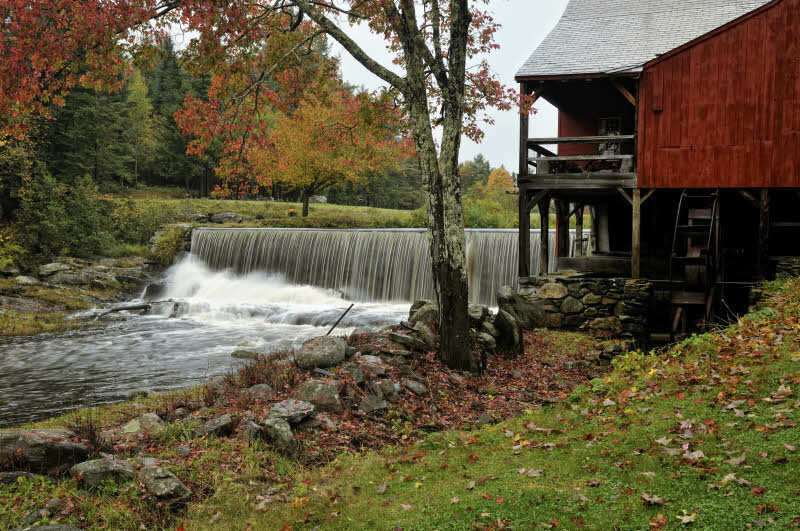 Be aware of the temptation to keep “everything” or too much – like I was with the yellow tree on the far bank and the foreground granite slabs giving me a leading line to the mill. Remember your vision, i.e., what attracted your eye, and remove all else such as more trees than necessary and extraneous elements like the slabs. Next, moving closer, we have this second version taken from the vicinity of the farthest stone slab in the 1st image. How many trees are needed to say autumn? not as many as in the first version. and were the slabs necessary? Note the difference in perspective by moving closer with my feet as shown here as opposed to if I had stayed in the further location and zoomed in (or even worse, cropped the first image in post-process to achieve the zoomed portion thus getting both a poor perspective plus loss of 50% of the pixels that you paid all of that money for). An obvious perspective change, if you hadn’t noticed, is the separation in space between the near center tree and the mill. If you want this separation, it can only be achieved by changing your position – and not your focal length. While this version is better in terms of simplifying and thus focusing on the elements that attracted me, follow the advice – move closer. Here’s the final version (but I took many more from many distances, angles and elevations). I’m standing next to the near center tree of the 2nd version and have turned slightly to my right to include both this tree and another to its right (not visible in the first two images). This one reduces the contents of the picture space to the key ingredients of my vision and little else. The mill, the main attraction to my eye, is prominent (but I don’t need to show the viewer the entire mill for them to know what it is and what it looks like – leave something to the imagination). 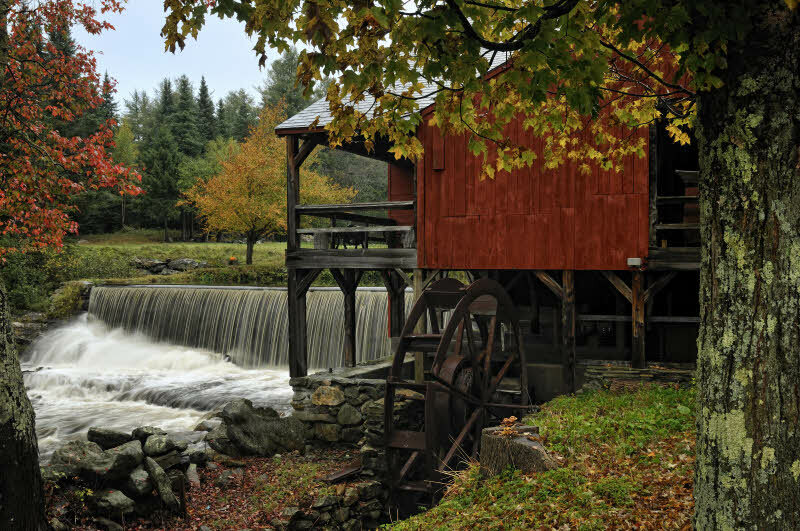 Further, the mill’s water wheel – almost unseen in the two further versions – is visible and completes the “this is an old mill” story. The fall trees are evident. In fact two of them are used to frame the image. Can anything be removed without detracting from my vision? I don’t think so. Was this perspective possible by zooming instead of walking? For ease of comparison, here are all three images together. Getting lower in the final version, thus not covering as much of the mill with the framing foliage at the upper right, might be better – or not? As an aside, this was done during a day when over 6 inches of rain fell in VT compliments of tropical storm Nicole. If you are well prepared (protective gear for yourself personally & your camera) there’s little excuse to miss a photo-op. Have you ever noticed that outdoor photographers are almost the only tourists who cheer when cloudy, rainy weather is forecast? For a related post – getting closer with macros & closeups to simplify and make abstract images. – matching floral image examples with Georgia O’Keeffe quotes. This entry was posted in Composition and tagged Photography, Photography Tips, Visual Design by Ed Knepley. Bookmark the permalink. Ed, I really enjoy your articles, but this one is so very practical and the examples you gave are so helpful. Thanks so much! This was very interesting, and quite informative. It’s interesting to see how just simply moving in a few steps completely changes the outcome. 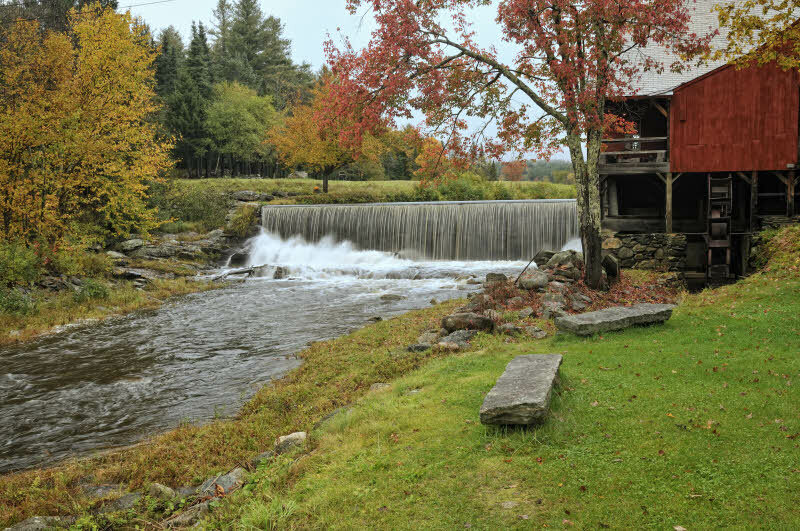 It also helps that VT is such a lovely location.